Born in poverty, he was trained in religion by pious parents. For many years he embraced poverty as God's will for him, and spent his time caring for the poor and sick. When he worked the fields, an angel would sometimes man the plow so that Guy could pray without distraction. He hung around the local church so much the priest made him the parish sacristan; Guy then lived in the church, and often spent all night in prayer. Raised in a prosperous Christian family; his grandfather was an early convert, and brought his family into the faith. When the priests were all executed or kicked out of the country, the family began to be harassed by locals who were returning to paganism, and they moved to the capital city of Seoul, Korea. There they became involved in some legal entanglements, lost most of their wealth, moved to a village on Mount Suri, and became tobacco farmers. Other Christian families, seeking support in numbers, moved near them, and a faithful Catholic community developed. Franciscus, by this time married and a father, served as catechist, teaching the faith to people in his home at night; he did not have a theological education, but had access to several spiritual texts, and was a man who loved God. In 1836, his son, Thomas Yang-eop was chosen by Saint Pierre Maubant of the Society of Foreign Missions of Paris to study for the priesthood in Macao. Francicus and Maria were overjoyed, and considered the entire family to be blessed. In 1839, state-sponsored persecution of Christians began again in earnest. Franciscus collected money to support those in prison, who were left by the state to fend for themselves, and gave Christian burial to those who died for their faith. 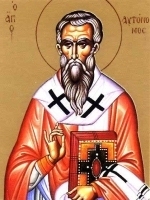 Back home, he gathered all the religious objects in the village and buried them so that they would not be defiled, and could possibly be used later; he kept his catechism texts, and continued studying and teaching. 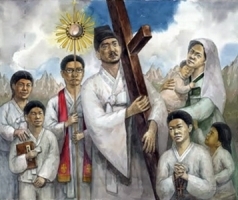 Franciscus, his family and about 40 of his fellow villagers were arrested on the night of 31 July 1839 for the crime of being Christian, and forced to march to Seoul. There he was ordered to renounce Christianity; when he refused, he was imprisoned; he was in the same prison as Saint Lawrence Mary Joseph Imbert. Between torture and beating sessions over the next several weeks, he spent his time in prayer and catechesis to other prisoners. Martyr. His wife Maria, who watched him die, renounced Christianity; she later reverted to the faith, and was eventually beheaded herself. Their son Thomas was ordained in 1849 and returned to Korea to serve as missionary in remote villages. Disciple of Saint Patrick. Effective evangelist throughout Ireland with the support of King Aengus of Munster. Noted for his charity and his excellent preaching. Little else is known for sure, but many stories and much speculation have attached to Ailbhe. He may have been the first bishop of Emly, Ireland. He may have founded a monastery at Killeaney, Inishmore, Ireland. One old story stays that he was born to parents so poor that they were unable to feed him, and abandoned him in the deep woods; a she-wolf, running from hunters, settled beside the baby and suckled him as one of her cubs; the hunters found them, saved the baby and spared the wolf. Feast of the entire Latin Church. It was first observed at Cuenca, Spain in 1513, then extended to the universal Church and assigned to its present place and rank by Pope Innocent XI in 1683 in thanksgiving to God and the Blessed Virgin for the liberation of Vienna, France and the signal victory over the Turks on 12 September 1683. 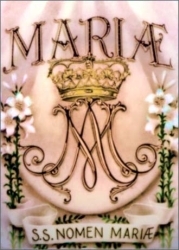 It is the titular feast of the Society of Mary (Marianists) and of the Congregation of the Oblates of Mary Immaculate. Franciscan Friars Minor (Observants) priest. Missionary to Japan during the 17th century when Christianity was a capital offense. Imprisoned soon after his arrival, Apollinar spent over five years on death row during which he converted his jailers, ministered to other prisoners, and spread the Word of God. Salesian brother, joining in 1767. Teacher. Imprisoned on a ship in the harbor of Rochefort, France and left to die during the anti-Catholic persecutions of the French Revolution. One of the Martyrs of the Hulks of Rochefort. Born to the nobility, grand-daughter of King Ethelbert of Kent. 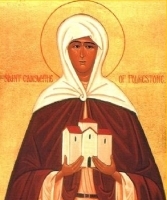 On the coast near Folkestone, she founded the first convent in England; it was later destroyed by invading Danes. Benedictine monk in Sainte-Foi, Tomieres, France. Abbot of San Victorian, Ainsa, Aragon, Spain. Bishop of Roda de Isábena, Aragon, Spain. The see was moved to Babastro, Spain after it was re-captured from the Moors. Bishop. Fled to Bithynia, Asia Minor to escape the persecution of Diocletian. The people there accepted him as one of their own, and he became a great evangelist. Martyr. First century evangelist. First bishop of Pavia, Italy. Worked with Saint Hermagoras of Aquileia and Saint Syrus of Pavia. Bishop of Iconium, Asia Minor. Martyred in the persecutions of Valerian. A group of Christians martyred in the persecutions of Diocletian. We know little more than their names - Hieronides, Leontius, Sarapion, Seleusius, Straton and Valerian. Three Christians who were martyred for destroying pagan idols. We know little more than their names - Macedonius, Tatian and Theodolus.